The year 2016 marked the 100th anniversary of the National Park Service in the United States. As part of the centennial celebration, the NPS did a fantastic job of promoting some of America’s top national parks to tourists – too good of a job in some cases, it seems. Today, you can’t visit parks like Yosemite and Zion and Yellowstone during the summer months without sitting in stand-still traffic, fighting for parking spots, and running into way too many other people on hiking trails and at popular overlooks. But, as someone who lives near a totally underrated national park, I know that not *all* national parks are suffering from crushing visitor numbers. There are plenty of NPS-managed sites across America that are still beautiful and relaxing and just downright awesome to visit. 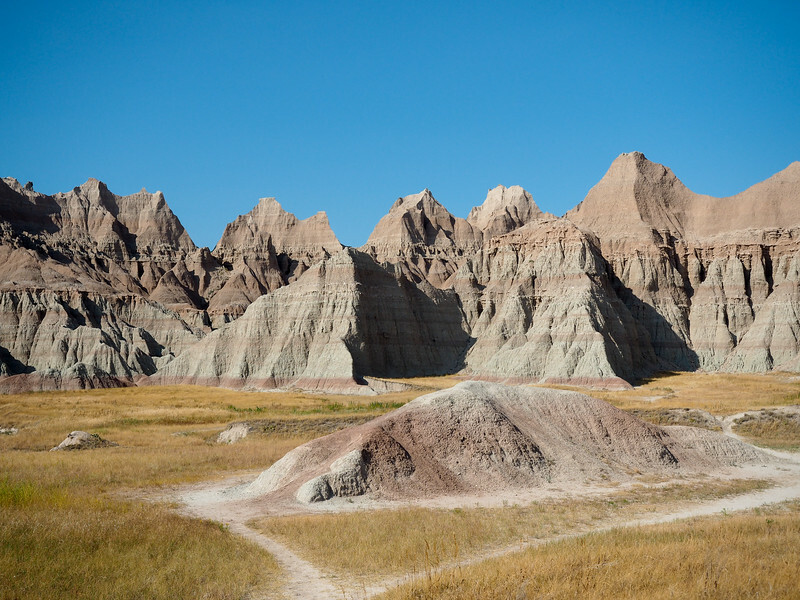 And I’m convinced that Badlands National Park in South Dakota is one of them. 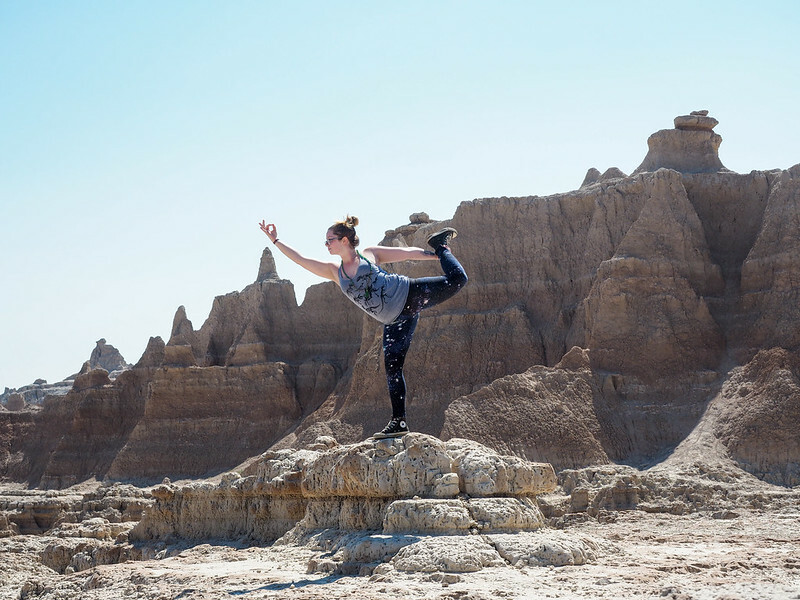 Whoever came up with the name for Badlands National Park clearly did not have any sort of degree in marketing or advertising. After all, anything with “bad” in the name will automatically sound a bit unappealing to a lot of people. No one wants to go to a “bad” national park. 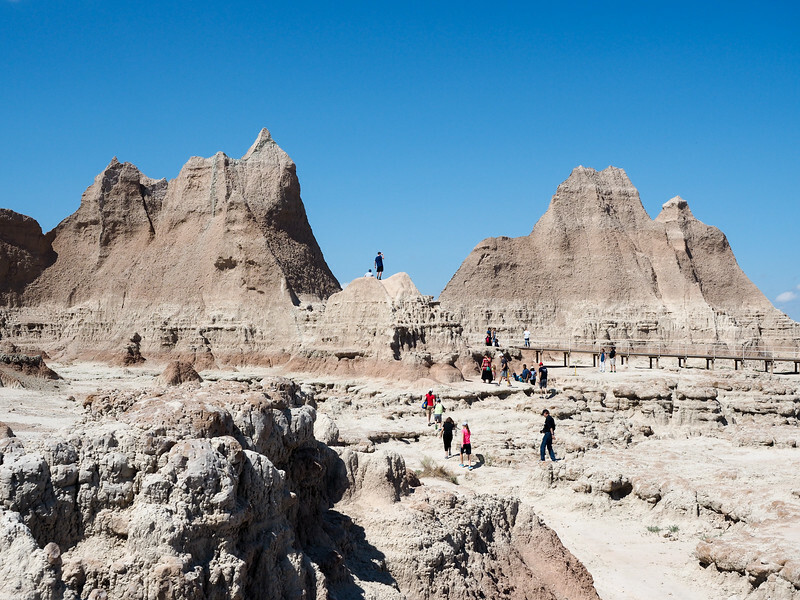 But “badlands” actually just describes a type of landscape, so I guess the initial name-giver gets a pass. 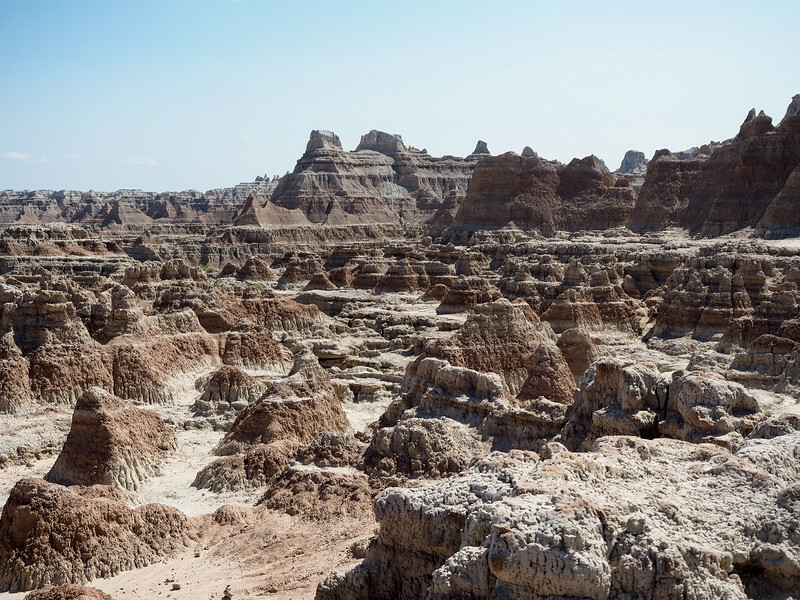 Badlands are generally a dry, crumbly terrain where softer sedimentary rocks and soils have been heavily eroded by wind and water, often causing interesting rock formations and patterns. 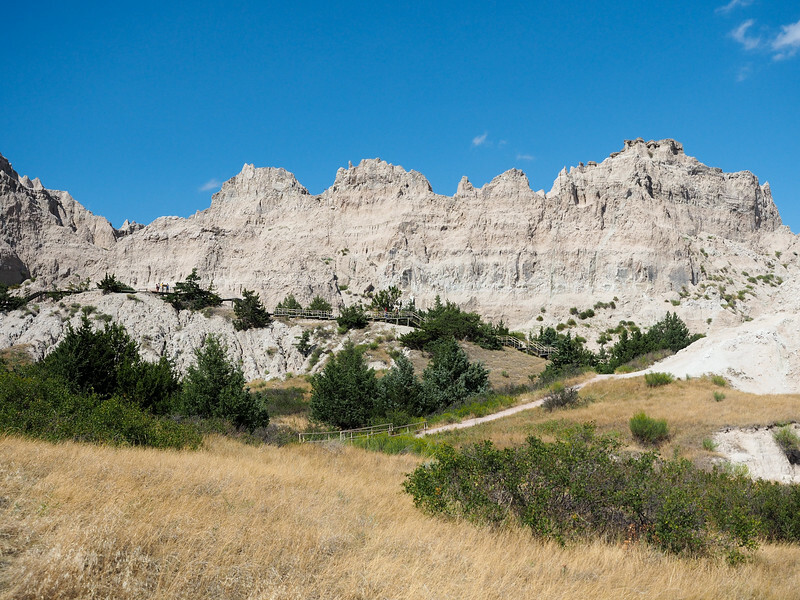 You can find badlands in a lot of places (and even in a lot of other places in the US), but Badlands National Park protects a particularly large swath of this unique landscape. 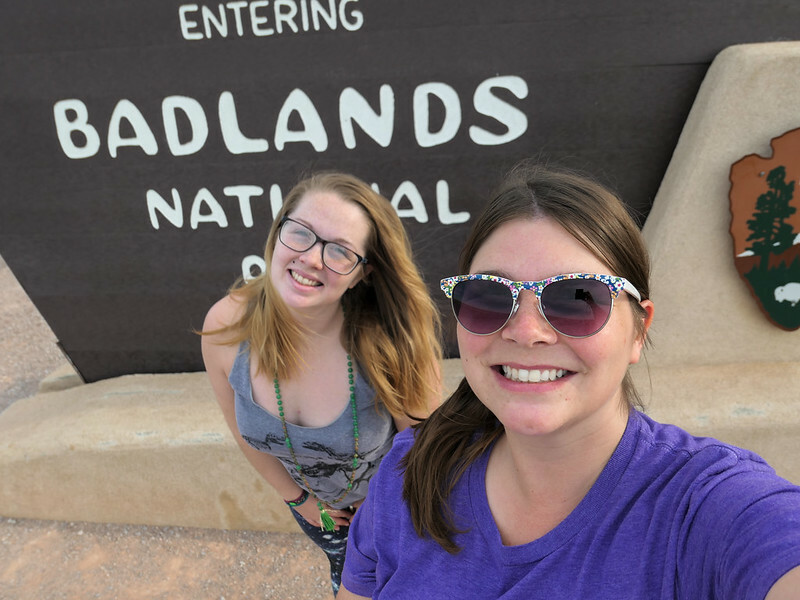 My sister and I visited the Badlands on a road trip through the northern part of the United States. 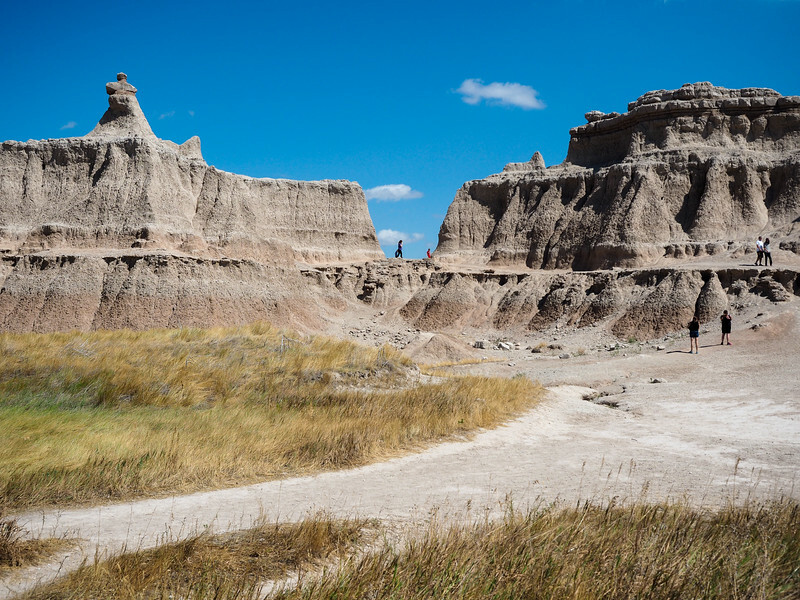 It was the place I was most looking forward to seeing in South Dakota, and it and its crazy rock formations definitely did not disappoint. 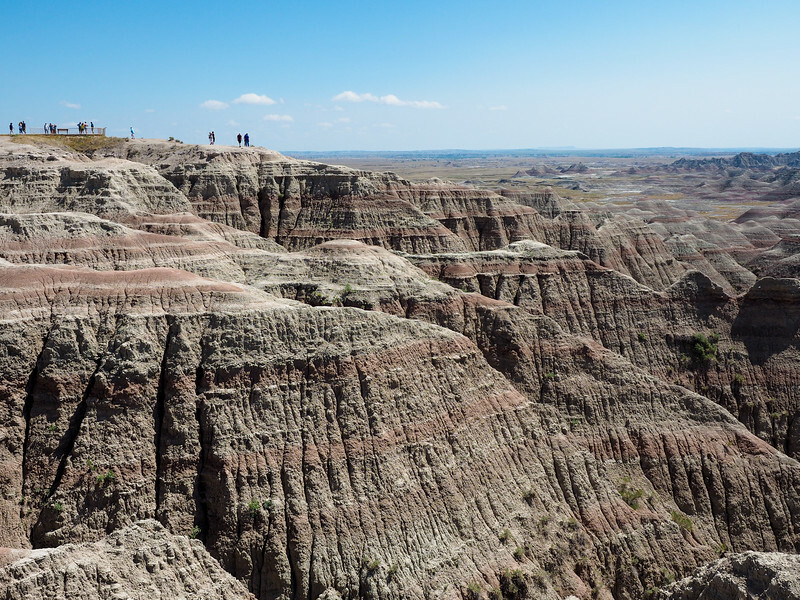 There are actually two different “units” of Badlands National Park, but it’s the north unit that is most often visited since it’s right off of I-90 in South Dakota. My sister and I entered this northern part of the park via the northeast entrance and spent a few hours exploring. 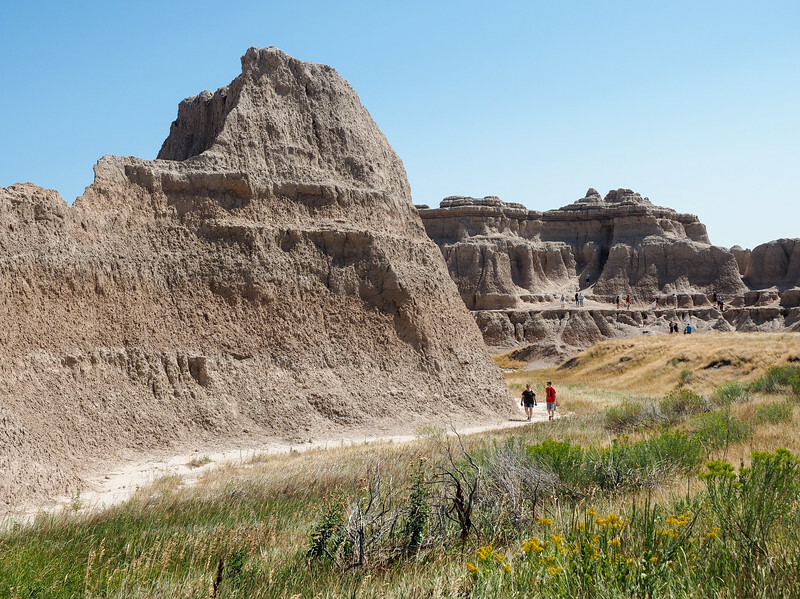 There’s one long hike in Badlands National Park (the 10-mile Castle Trail), but the majority of the hiking opportunities here are on shorter trails that are accessible for most people. 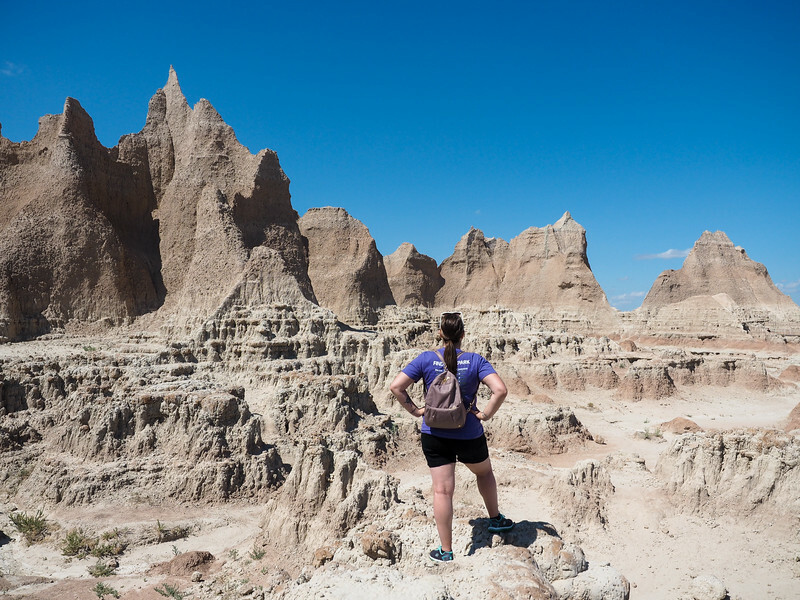 We hiked the Door Trail first, which is a short trail (.75 miles round trip) that starts out as a boardwalk and deposits you out into the badland rock formations, where you can choose to hike more if you wish. There’s a loose “trail” marked by yellow poles, but people tend to just wander all over the place. We had fun posing with the crazy rock formations. 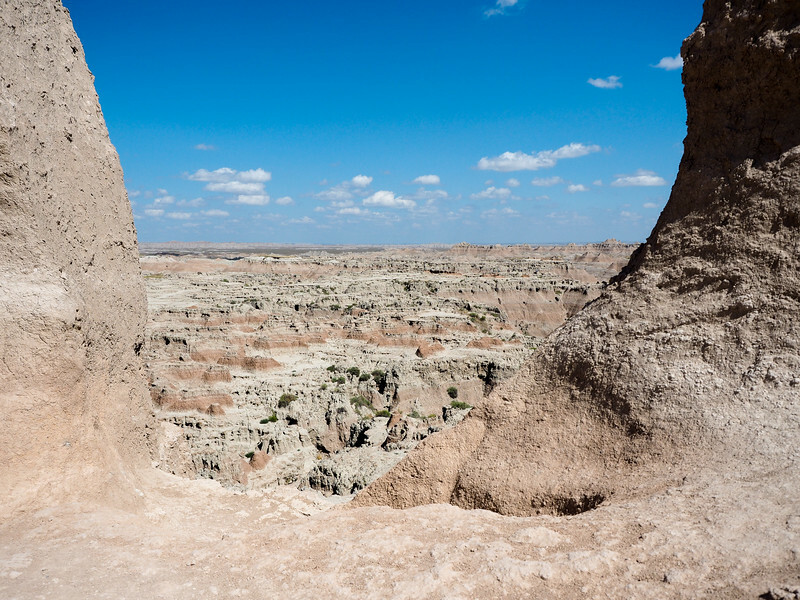 Next we headed over to the even shorter Window Trail, which leads you up a small hill to a “window” in the rock that gives you a view out over the Badlands. You can check out the other hiking trails in the park here. 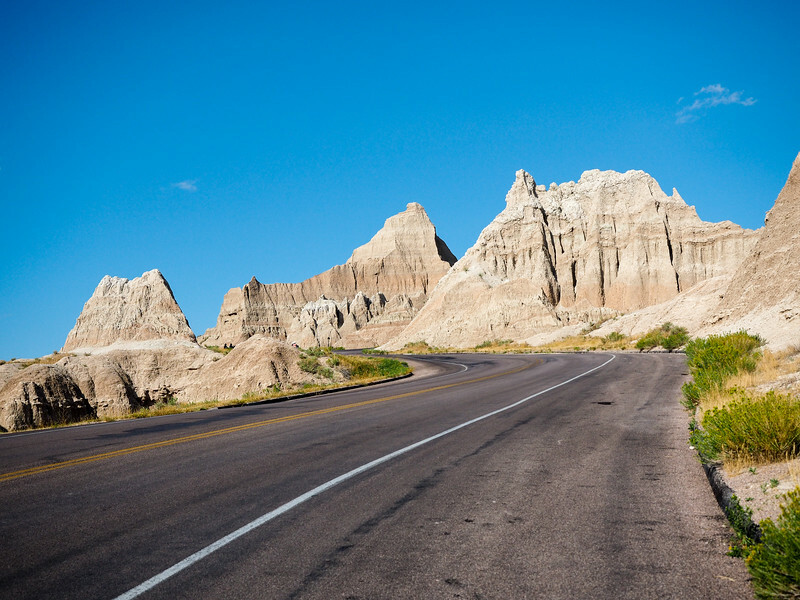 The most popular thing to do in Badlands National Park is of course to drive the paved loop road that traverses the length of the park’s north unit. 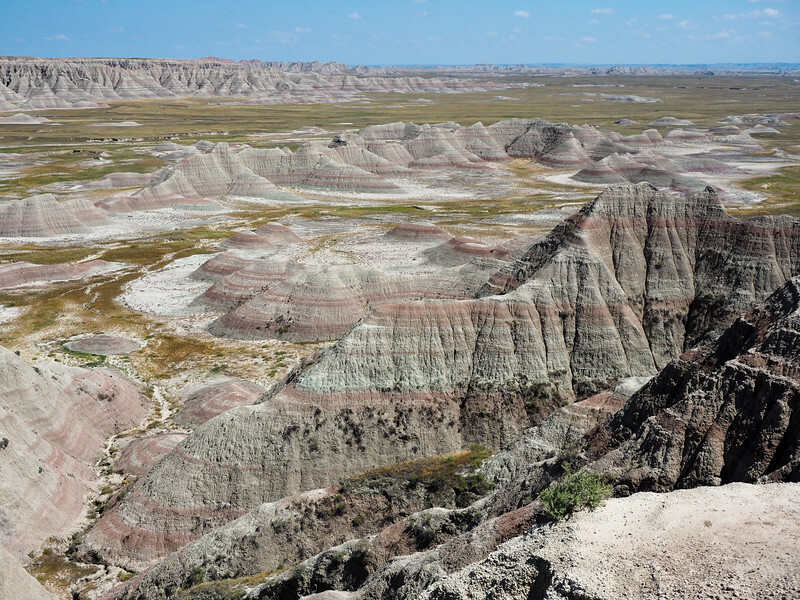 The Big Badlands Overlook (right after the northeast entrance station to the park) was one of my favorites, and I also loved the Yellow Mounds Overlook since it gives you a glimpse at some different types (and colors!) of rock formations. The visitor center in this northern part of the park is definitely worth a visit. 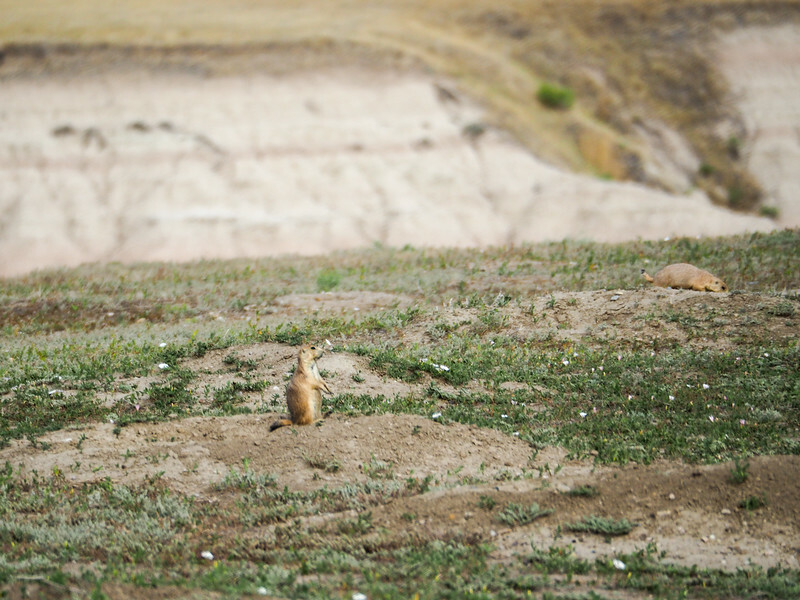 There are some exhibits that explain the history of the park (these hills were once covered by an ancient inland sea), and you can also visit the fossil prep lab, where they work on the many fossils found in the Badlands. 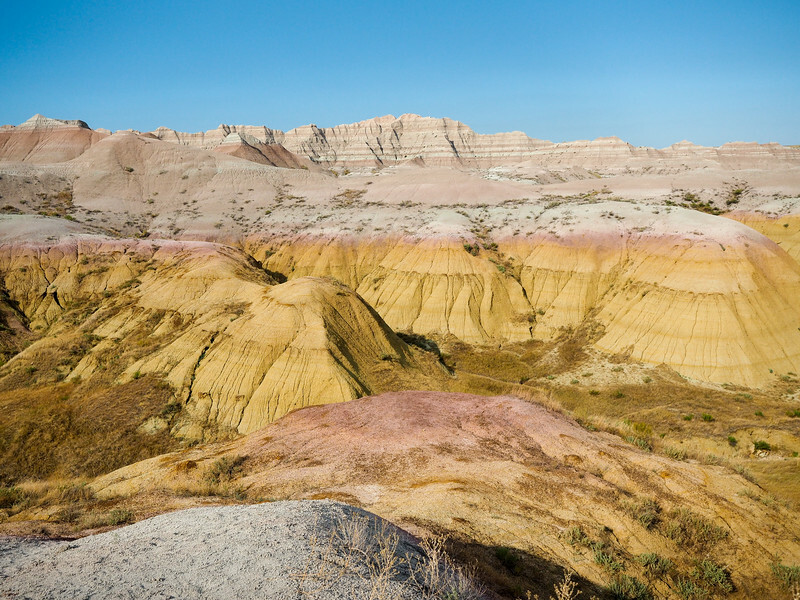 No dinosaurs have been found here since the Badlands would have been underwater during that time, but they’ve found plenty of other cool fossils. Be prepared for heat – During the summer months, it can get HOT here. My sister and I were lucky and had fairly mild weather, but it’s not uncommon for temperatures to top 100 degrees F here in the summer. 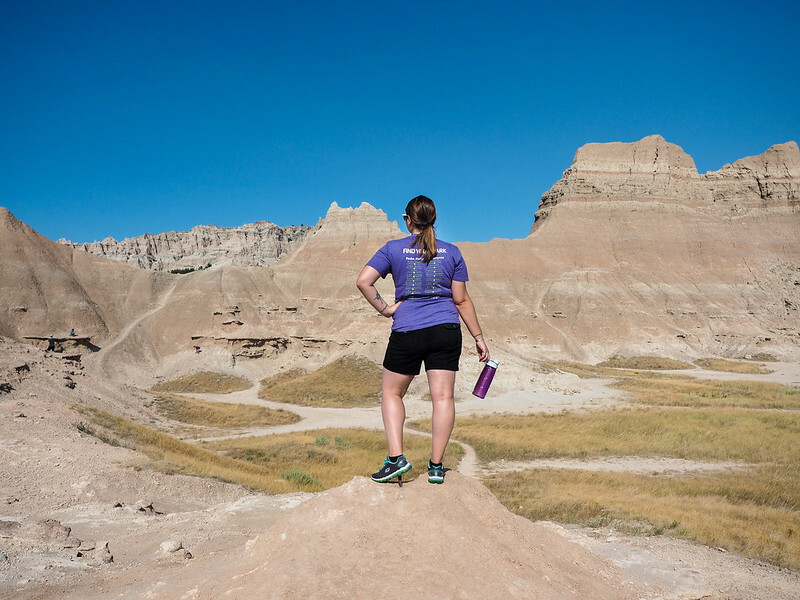 If you’re visiting during this time, be sure to have plenty of water on hand even for the shorter hikes (you can re-fill your water bottle at the visitor center), and apply plenty of sunscreen as there’s not a lot of shade. 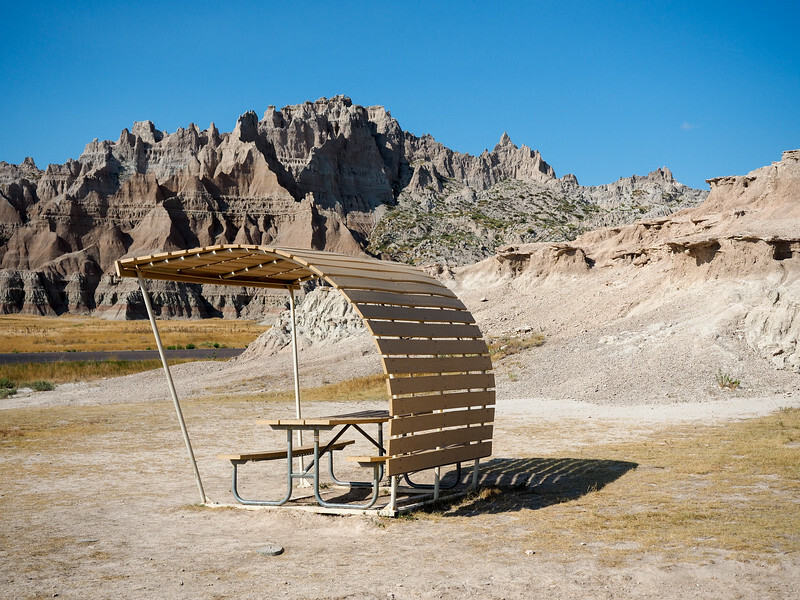 Allow enough time – My sister and I allotted an afternoon for the Badlands, but to be honest we could have easily spent a full day here. When you add up the short hikes and stops at overlooks, you’ll definitely want to allow at *least* 4-5 hours minimum to truly appreciate this park. 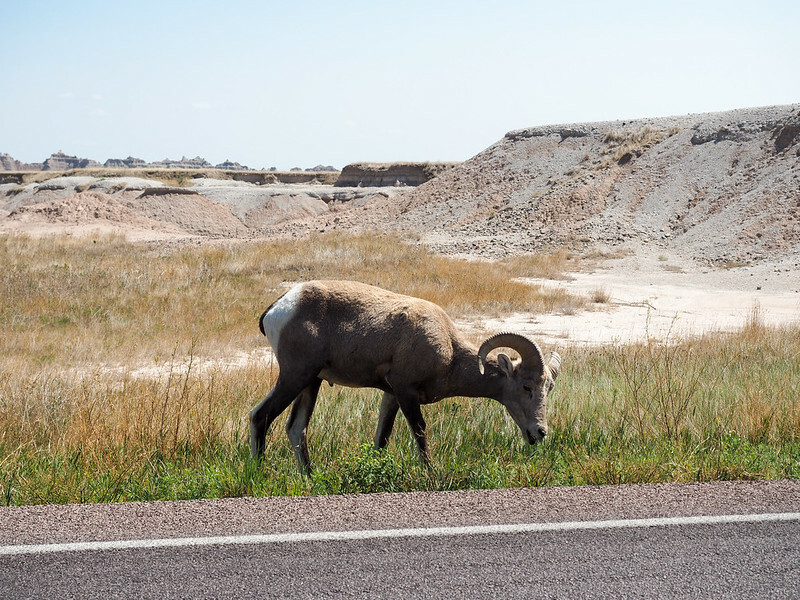 Watch out for wildlife – Animals like prairie dogs, bighorn sheep, and even bison call this part of South Dakota home, so definitely keep an eye out for them as you drive. But please, DO NOT approach or try to feed these animals if you see them. They’re wild and can be dangerous (and you can be dangerous to them, too, if you try to feed them people food). 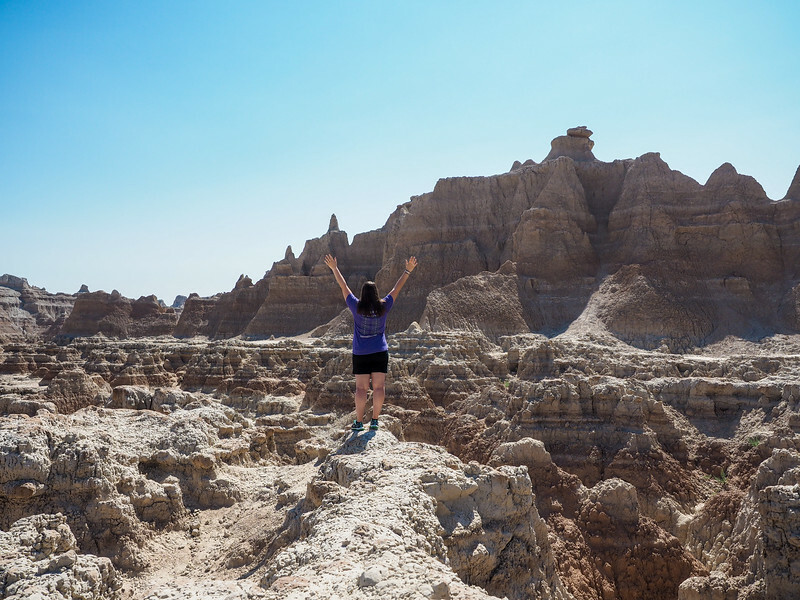 After reading this far and seeing all the photos, you might not be surprised to hear that I think the Badlands is one of the more underrated national parks in the United States. It’s pretty darn unique as far as parks go, and yet is still a place you can visit without long lines of cars or way too many people. 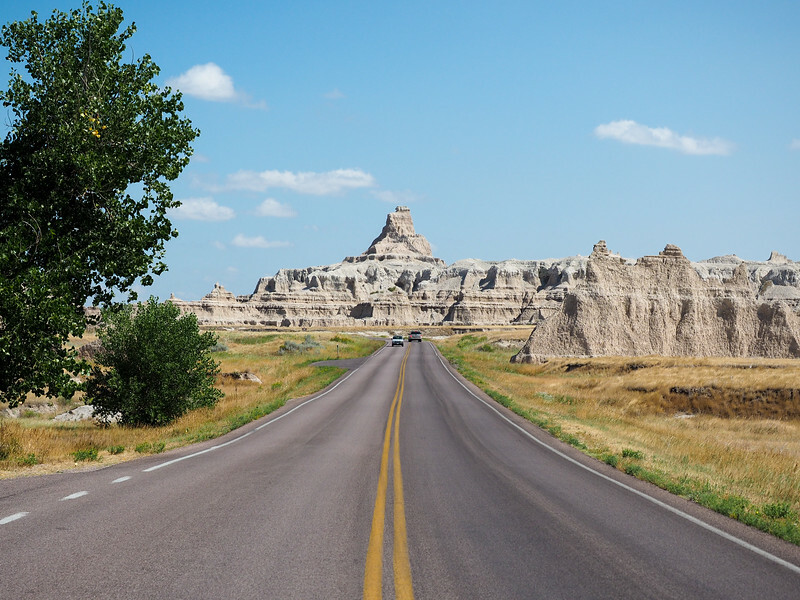 If you’re debating on whether to add South Dakota to your next road trip itinerary, my vote is to do it just so you can visit this oft-overlooked national park! 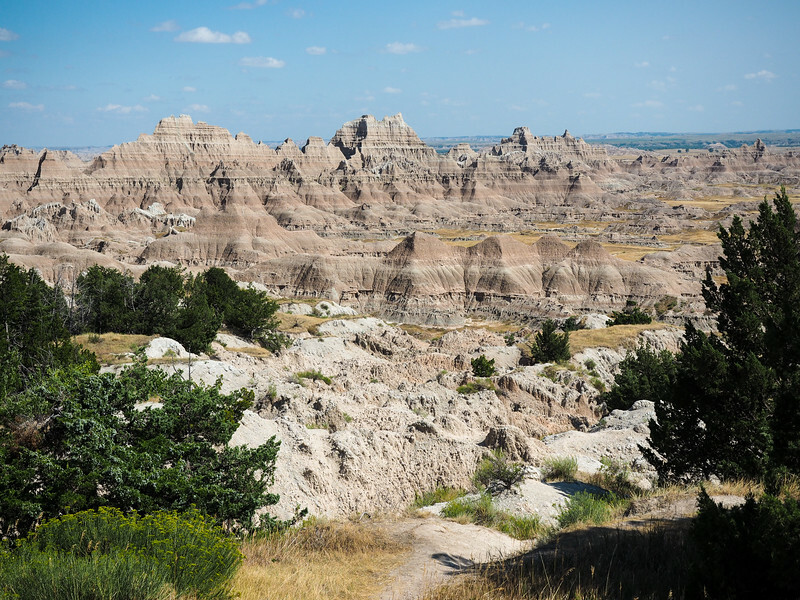 Have you ever been to Badlands National Park? If not, would you like to go? Previous articleHow do you keep kid’s social skills up while traveling? I really wouldn’t let internet traffic or stats bother you so much. I fully understand about getting your words “out there”, but sometimes the cost of sanity is not worth the pressure one puts on yourself. If the wonders of analytics takes a dip, and you concentrate on posting more, then maybe you start to make a few typos, or the content slides. Sure comments of 100 plus may some your way, but then that leads to more personal obligation to hit up facebook or twitter more often. Then you’ll only start to add metrics from social media too. Before long you’ll be hankering online 24/7 looking at klout scores, pages liked and RT’s. Before long you’ll end up worn down and haggard by the “obligation” and “peer” pressure of it all. Many people in the “new” travel blog craze are sitting behind desks, or spending more time blogging about travel than actually doing it. And when they do, they end up panicking over ratings, grades and numbers than traveling. Unless you supported by a hefty wallet, and / or are in a developed country with 24/7 internet, one simply cannot compete with the “business travel bloggers”. And, that’s how they are treating. Instead, I would suggest you create you’re own niche, and go by your own rules. It makes life, travel, and business a lot more relaxing everyday 🙂 Just my 2cents! Riding on cargo trains is one of those legendary beatnik type of experiences that you dream about and imagine as reaching the point of ultimate freedom. Unfortunately the reality is actually extremely uncomfortable and rather a regrettable experience. However the STORY you are able to tell afterwards is usually worth the pain you went through and in that light, the regret vanishes…after a few years. I did it in the States when I was a crazy teenager traveling around the U.S., we hopped a moving cargo train somewhere in Arizona and rode for hours sitting on the floor of the empty car with our feet hanging out watching the scenery go by. When the train stopped, we jumped off, only to realize we were in the middle of the desert somewhere with no paved road in sight. All our water was gone and we walked for hours, completely lost until we came to what could only be described as a sort of a ghost town. A tumbleweed actually rolled past in front of us as we entered this place and there were about half a dozen very skinny dogs just hanging around with no collars or signs of domestication at all. We could barely speak our mouths were so dry as we came to an elementary school that seemed to be empty.. but there in front of the school was some kind of miracle. A soda machine stood and to our eyes it was shining and glittering like a god of hydration and compassion. We walked up to it reverently only to find out that our salvation only cost 50 cents. I pulled out a dollar bill but realized there was no place to insert it. It was one of those older machines that only took quarters. We emptied our pockets. No quarters. We opened our backpacks and turned them upside down, dumped everything out on the ground. No quarters. What a cruel god of hydration this was…to offer this relief but not fulfill its promise, to laugh at our suffering. We went around this frighteningly quiet ghost town trying to find a person who would be willing to give us 4 quarters for a dollar bill. At last we found a small boy who seemed to appear out of nowhere. He seemed to already know what we wanted but we asked him anyway. And yes he did have quarters. But only 2. Would we be willing to trade one dollar for 2 quarters losing half the value of our money? You bet, we were willing. The boy gave us the 2 quarters, took our dollar bill, and ran off with a wry smirk on his face, obviously pleased with his earnings. We felt cheated. But only for a moment. In the next moment, we experienced nirvana when the taste of Dr. Pepper touched our lips, rolled smoothly down our throats, and quenched our thirst. Not as thrilling as your wet and rainy experience in Cambodia, but another cargo train story to tell, just the same.